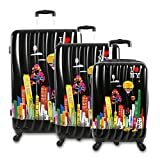 Go anywhere and do anything with your J World ILNY Cityscape II 3 Piece Luggage Set. Take just one or use all three for an epic trip to a colder climate. The smallest of the trio is carryon friendly and is designed to go in airline overhead compartments or under the seat. Colorful art teams up with the I LOVE NY logo for a distinctive and artistic presentation on the impact-resistant ABS plastic sides. Interiors are equipped with elastic straps and mesh pockets to counteract shifting. Each case is expandable and features highly maneuverable swiveling wheels and a telescoping handle that retracts fully at the touch of a button. 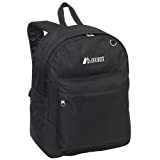 Dimensions Small: 21W x 14D x 9.5H in. Medium: 25W x 17D x 10.6H in. Large: 29W x 21D x 13H in. Set includes: 21, 25, and 29 in. Upright. Features interior straps and pockets. Choose from available colors. Made of acrylonitrile butadiene styrene (ABS). Retractable handle. Maneuver with ease with 4 corner wheels. TSA approved combination lock. Expands for an extra 2.5 in..
FERGÉ – young French design philosophy. The brand hold up to its promise to only use manmade materials and materials which help to safe the environment (e.g. light tec materials, non-animal, etc). 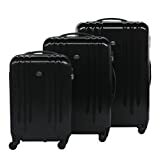 Designed with the traveller in mind, this 3-piece suitcase set features one 28″ suitcase and one 24″ suitcase that are suitable as checked baggage, and one 20″ suitcase that can be used as a carry-on. Trolley set of lightweight rolling hard-shell suitcases made out of durable DURE-FLEX material. Luggage that is unmatched in its combination of high-quality, light weight, durability, and brilliant design. The trolley set features 4 very smooth-running and silent rolls (360 degrees), as well as a 2-step lockable trolley system, enabling simple and, if desired, speedy transport. The two larger suitcases each feature 2 handles (on top and on the side), making carrying or lifting significantly easier. The inside compartment allows for easy and organized packing. Everything remains in its intended spot due to the dividers and luggage straps. The 3-digit combination lock lets you protect your valuables from thieves. DURE-FLEX case: premium ABS material – tough and built to last, the blend offers strength and flexibility, so that it will not crack or smash.